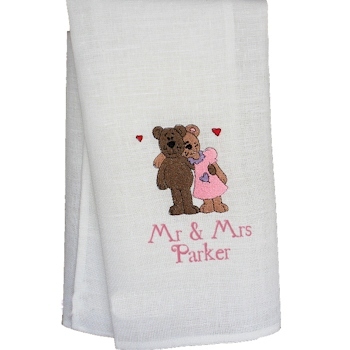 Personalised tea towel featuring an adorable Mr and Mrs Teddy Bear embroidered with names or a little message to make a truly special gift. Personalised tea towel featuring an adorable Mr and Mrs Teddy Bear embroidered with names or a little message to make a truly special gift. Unique and useful gift idea for men or women even for a wedding anniversary or Valentines Day! Choose the Text. Personalised tea towel featuring an adorable Mr and Mrs Teddy Bear embroidered with names or a little message to make a truly special gift. Unique and useful gift idea for men or women even for a wedding anniversary or Valentines Day! Choose the Text. Choose the thread colour and font style. We will produce your gift especially to order and ship your unique gift to you or your chosen recipient. 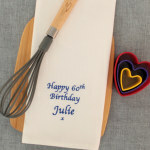 We use natural cotton tea towels with a thick weave which makes them very absorbent. Hemmed on all the sides. A good size tea towel at approx 43cm wide x 72cm long.